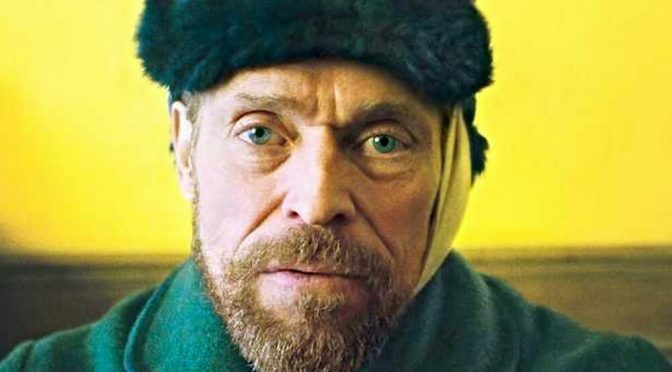 All eyes on the prize for Best Performance by an Actor in A Lead Role in this year’s Oscar race seem to be on Rami Malek or Bradley Cooper, but there is another contender of equal if not greater worth, Willem Dafoe, for his pitch perfect portrayal of Vincent Van Gogh in AT ETERNITY’S GATE. Directed by Julian Schnabel and co written by Schnabel, Jean-Claude Carrière and Louise Kugelberg, AT ETERNITY’S GATE comes directly out of Schnable’s personal response to his paintings, not just what people have written about him. A noted painter himself before he took up the camera, Schnabel has endeavoured to convey the essence of the artistic drive and not merely present a pictorial biography. AT ETERNITY’S GATE began in the museum. Julian Schnabel took his friend, the renowned French screenwriter, novelist and actor Jean-Claude Carrière to the Musée d’Orsay to see the exhibit entitled “Van Gogh/Artaud: The Man Suicided by Society” (drawn from French playwright, poet and visionary Antonin Artaud’s book of the same name). Popular opinion has tried to make out that Van Gogh was mad, a lobber of lobes, a self-harmer, and finally a suicide, but AT ETERNITY’S GATE is not complicit or complacent with that. It is concerned with a painter who came out of the northern mists into the southern brightness in search of truth and beauty. The film makers follow his physically demanding path, in order to see what he saw. Silence is as important as dialogue, landscape as much as portraiture. To make this film they went to all the actual places Van Gogh worked and lived in his last two years—Arles, the asylum in Saint-Remy, Auvers-Sur-Oise. It’s told mainly in the first person, facilitating the audience to have a chance to live a little inside this man, instead of watching from afar. To enhance the film’s first-person POV, director of photography Benoît Delhomme and Schnabel made the decision to at times use a split diopter on the lens—which creates the vertiginous effect of two different depths of field in one image. Visually visceral and viscerally visual, AT ETERTINITY’S GATE has an artistic aesthetic rarely captured in films in search of the muse and temperament of painters. 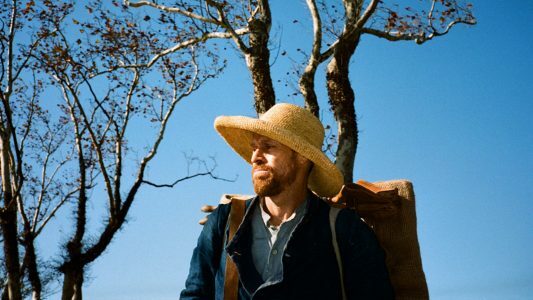 AT ETERNITY’S GATE shows Van Gogh as something more and infinitely better than a painter attempting to shape a visible image of his soul lit by flashes of exaltation. As Van Gogh, Willem Dafoe defies caricature or mere impersonation – although his resemblance is remarkable – to present a man touched by super nature, a haunted enigma made flesh, full of impetuosity, choked by anguish, bruised by poverty and pain, a talent transcendent. Van Gogh is the main attraction, defined by Dafoe’s sublime performance but the supporting cast splashes and daubs an astonishing array of portraits. Mads Mikkelsen is profoundly fine as a priest whose discussion with Vincent takes in the physical and ephemeral, the spiritual and temporal. Mathieu Amalric plays a psychiatrist trying to fathom Vincent’s psyche, and Niels Arestrup plays a fellow inmate of the asylum, a veteran soldier made insane by his vocation. Rupert Friend is superb as Vincent’s brother, Theo, as is Oscar Isaac as Paul Gaugin. AT ETERNITY’S GATE is a film ablaze with colour and spirit and audacity. Like its subject, Vincent Van Gogh, it is a true original.